Downstairs: 1 bedroom, 1 handicapped bathroom with walk / passable shower and toilet, fully equipped luxury kitchen, dining area in the conservatory, and an open living area with views of the First - 2 sofas, table, stove, cable TV, DVD player, stereo system and 2 log. The ground floors is barrier-free. Upstairs: 2 more bedrooms, a second bathroom with tub and infrared sauna and separate toilet with a larger sink. Wohngalerie and 2 sun balconies accentuate the stylish character. Beds are dressed with linen, hand / bath towels are in the bathrooms for you. Outside: 3 parking spaces at the house. The house is surrounded by lawn and meadow with fruit trees and just above the town on a hillside. Therefore, you have a fantastic view of the countryside and the nearest city. The nearest towns are Volkmarsen, Bad Arolsen and Warburg. Pets welcome on request. 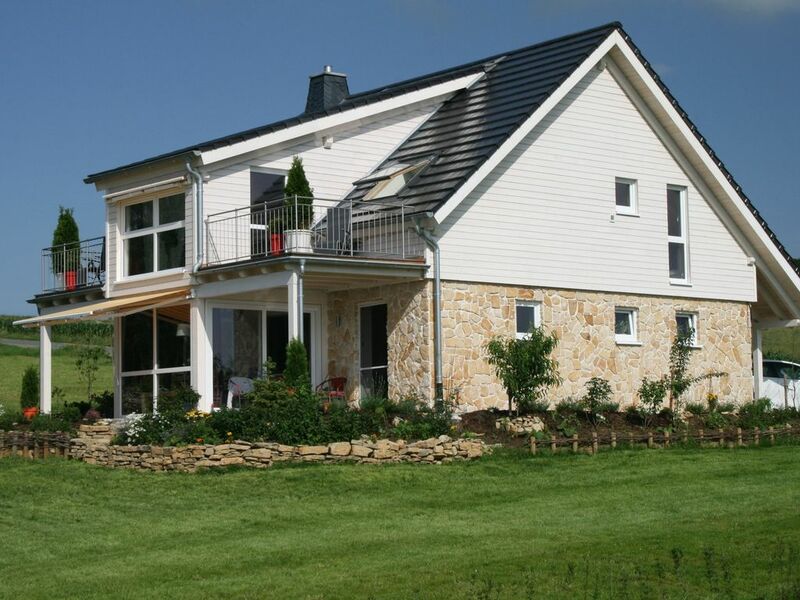 You live in a newly built, about 140 square meter exclusively furnished holiday home on a slope with 20 km distant view of meadows, groves and fields on the hills of the Habichtswald. A south facing conservatory allows you all year to enjoy the magnificent view of the surroundings and already in the morning to enjoy your first cup of coffee at the long wooden table overlooking the countryside.
. The division of the bedrooms and bathrooms on both floors the house for example can be used as a 2-generation house: Downstairs: the grandparents take up quarters and in Above-parents with children. On the two log on the ground floor and the two sun balconies upstairs you can depending on how the wind is incident, sit undisturbed and enjoy the fresh air and the sun. Facilities include 4 garden chairs, 2 small garden tables and 4 sunbeds. Another special feature is the open design in Wohbereich that allows views to the ridge beam. A clad with sandstone walls and a fireplace on the ground floor and an upstairs gallery underline the Exklusiviität the entire house. Comfort comes in the evening on particular by the stove, with which the whole house can be heated comfortably warm. Washer and dryer are as common as the fully equipped kitchen with all appliances and bathrooms with quality features. The house is a Non smoking home and alergikerfreundlich equipped. Pets are possible on request. Car parking spaces are located directly in front of the house and will be charged. The house is quiet and traffic is just making it suitable for families with children. Features include a high chair, a changing table, a separate travel cot and stair and socket guards. On the associated large lawn, the children can play to their heart's content and play. The ground floor is suitable for the disabled and wheelchair users. In the house is free wireless connection available. Working in a relaxed atmosphere and peaceful surroundings at any time here. The bathrooms are generously proportioned and quality-modern. These suites each have a window. The lower bathroom is designed for the disabled: there is enough space for navigation with a wheelchair available, the shower is in addition also with a wheelchair access. Towels and bath towels are in accordance with the number of people in the bathrooms each of your expectations. Likewise, you can find for the little ones each have a Children's stool under the sink. Card is also equipped with a hair dryer and each a basic supply of soap, shampoo and toilet paper, and each have a laundry bag. In the upper bathroom with infra-red light-Sanua available. Wir (Eltern und 2 Kinder, 10 und 16 Jahre) waren 1 Woche Gäste in „Hörnchens Hörle“, aber leider ging der Urlaub viel zu schnell vorüber. Wer‘s lieber etwas ruhiger und individueller mag (kleines Dörfchen ohne Ferienhauspark und Touristentrubel) und trotzdem viel unternehmen aber auch mal einen faulen Tag daheim machen möchte, für den ist dieses Haus absolut geeignet. wir freuen uns, dass es Ihnen bei uns so gut gefallen hat. Vom Ausblick, den man vom Ferienhaus aus hat, waren wir von Anfang an auch begeistert und dieser war für uns damals ein Grund, "Hörnchens Hörle" zu bauen. Wir wünschen Ihnen alles Gute - vielleicht klappt es ja wieder einmal. Wir haben mit unseren 3 kleinen Kindern einen winterlichen Kurzurlaub geplant. Schnee lag leider nicht mehr, aber nicht schlimm. Das Haus ist toll, man fühlt sich direkt wohl und es bietet alles was man für ein paar entspannte Tage braucht. Begonnen mit einem vorbereiteten Kamin bei Anreise, Blumen auf dem Tisch, einer Kiste Wasser, einer Sauna, Lego für die Kinder und vieles mehr. Wir kommen gerne wieder! Das Haus ist toll und auch die absolut komplette Ausstattung (vor allem in der Küche und zum Kocehn) hat uns sehr positiv überrascht. Die Lage/Landschaft und Einsamkeit rundherum war aber für unsere "Zwecke" (Modellflug) fast noch besser, traumhaft! Wir werden wiederkommen! Wie schon erwähnt, sollte man mit Auto kommen, da es in der näheren und mittleren Umgebung kaum Möglichkeiten zum Einkaufen oder Ausgehen gibt. Das Haus ist toll und auch die absolut komplette Ausstattung (vor allem in der Küche und zum Kochen) hat uns sehr positiv überrascht. Die Lage/Landschaft und Einsamkeit rundherum war aber für unsere "Zwecke" (Modellflug) fast noch besser, traumhaft! Wir werden wiederkommen! Wir haben uns rundum wohl gefühlt. Hier fehlt es an nichts. Das Haus ist sehr modern, geschmackvoll und gemütlich eingerichtet. Die Lage ist top für alle, die ihre Ruhe haben wollen. Die Aussicht in die schöne Umgebung lässt allen Stress vergessen. Immer wieder gern, hier kann man nichts verkehrt machen. Wir hatten die Möglichkeit ein paar Nächte in diesem Wohlfühl-Haus zu verbringen. Das Haus ist mit allen eingestattet was man brauchen könnte. Der Kamin sorgt für die nötige Wärme und Stimmung. Wer in Ruhe mal Ausspannen will ist hier bestens aufgehoben. Auch für Gäste mit Hund zu empfehlen. Hörle is conveniently located near the A44 (Kassel - Dortmund) Motorway and is surrounded by numerous picturesque towns such as. Volkmarsen, baroque Bad Arolsen with Castle or shaped by its half-timbered houses Warburg. Immediately at the 'triangle' (Westphalia - Hesse - Waldeck) is shaped by the agriculture scattered village, which settlement history, from the 4th Century AD (1128 first mentioned in records) comes from. The village is surrounded by vast forests and nature reserves, as well as lakes, such as the Hessian largest reservoir, the Edersee or the Twistesee with its water ski facility or the Diemelsee, which is embedded in the Diemelsee- Nature Park. A variety of leisure and sports facilities leave during your vacation determined boredom. Beside one of the most beautiful and challenging golf courses in Germany, located right on the Twistesee, invites the Waldecker Land and the adjacent Upper Sauerland region as a holiday at sea, on land and in the air for many activities. How about z. B. take canoe, paddling, swimming, fishing, gliding, clay pigeon shooting, golf, cycling, mountain biking, hiking and Geotrecking .....! If you love history and culture, you will get your money. Likewise, if you want peace to disable z. B. from the busy (working) life. In winter the famous ski resort Willingen loads in the adjacent Sauerland, with half an hour's drive away with its well-groomed slopes and trails for a winter sports. Die Preise beziehen sich auf 1 Übernachtung für 2 Personen. Für die erste Nacht berechnen wir - abhängig von der Saison - € 155,- , € 180,- oder € 210,- (inkl. Endreinigung) jede weitere Nacht - abhängign von der Saison - € 80,- , € 105,- oder € 135,- Jede weitere Person € 17,- pro Übernachtung , Kinder bis 2 Jahre sind frei, darüber € 10,- pro Übernachtung, ab 14 Jahre € 17,- pro Übernachtung. Über die Kaution in Höhe von € 150,- werden jeweils die Stromkosten abgerechnet. Den sich ergebende Restbetrag überweisen wir zurück.